Anne Marie would like to create a marriage ceremony that is appropriate for you. Below you will find four choices of wedding services. Since you may find that you’d like a single one in it’s entirety you can combine selections from several. In addition you may want a marriage ceremony that resonates with tradition yet includes opportunities for departures from custom, a wedding that truly expresses your own uniqueness. Pre-wedding marriage service consultations are available by phone 340-626-4658, so that an appropriate marriage ceremony can be created with you. As your marriage ceremony should genuinely reflect what you both feel, you may wish to incorporate your own wedding vows. Therefore we will do whatever is your hearts desire. We are joyfully gathered today to witness and celebrate the joining of two lives in marriage. ____________________________ and __________________________ have invited you to be with them, and to rejoice with them in the making of this important commitment. The essence of this commitment is the honoring of another person in their entirety as life partner, everlasting lover, heart companion and soul friend. It is therefore a decision which is undertaken with great consideration and respect. Officiate focuses attention on the present moment. _____________________________ and ___________________________ have come together in the hope that the love which brought them to this union may go out beyond itself into the lives of others. Thus, we ask that the promise and hopes of this union be realized. May you both be granted the patience to listen, the capacity to understand, the compassion to give comfort, and the joy to laugh and to be yourselves. Let your marriage make a home, where neither person is ever lonely. Let it offer illumination and the excitement of shared discoveries. Let it be large enough to endure the difficult times. May life’s challenges bring you closer together and may you always be able to turn to each other. ____________________________ do you take ___________________________ to be your wife and equal? Will you share your life openly with her and promise to love, honor and stand beside her always, in times of joy and times of conflict? ____________________________ do you take ___________________________ to be your husband and equal? Will you share your life openly with him and promise to love, honor and stand beside him always, in times of joy and times of conflict? A circle is the symbol of sun, the earth, the universe, of wholeness, perfection, peace and of unity. Like circles, your rings have no beginning and no ending. They are symbols of the growing relationship you have come here to celebrate and confirm. As a sign of your faithfulness, place the ring on her finger and repeat after me. I take you _______________________________ as my wife through all of the experience life holds for us, in faith and love. As a sign of your faithfulness, place the ring on his finger and repeat after me. I take you _______________________________ as my husband through all of the experience life holds for us, in faith and love. Having heard the vows you have made to each other, witnessed by these loved ones, by the power vested in me by the Superior court of the Virgin Islands, I now pronounce you husband and wife. Family and friends, Mr. And Mrs. __________________________________________________. We are joyfully gathered to celebrate the joining of two lives in marriage. So let us take a few moments to focus our full attention on_____________________ and ___________________________. Everyone take a few deep breaths and relax. As we breath deeply and relax completely together, please send your loving energy and thoughts to_____________________________ and ___________________________. So it is with reverence and joy we create this ceremony together. _______________________wilt thy have____________________to be thy wife to live together in the holy estate of matrimony? Wilt thy love her, honor her, comfort and keep her in sickness and in health and forsaking all others, keep thee only unto her for as long as ye both, shall live? ________________wilt thy have______________________to be thy husband to live together in the holy estate of matrimony? Wilt thy love him, honor him, comfort and keep him in sickness and in health and forsaking all others, keep thee only unto him for as long as ye both, shall live? I,_________________take thee____________________to be my wife, to have and hold from this day forward, for better for worse, for richer for poorer, in sickness and in health, to love and to cherish till death do us part, and thereto I give thee my trust. _____________________________, please hold__________________hands, and looking into his eyes, repeat after me. I,________________take thee_____________________________to be my husband, to have and hold from this day forward, for better for worse, for richer for poorer, in sickness and health, to love and to cherish till death do us part, and thereto I give thee my trust. The wedding ring is the outward and visible sign of an inward and spiritual grace signifying to all the uniting of this man and this woman in holy matrimony. _________________________please place this ring on____________________finger and repeat after me. With this ring I thee wed: with my heart, I thee honor, with my soul, I thee love. _____________________________please place this ring on_____________________________finger and repeat after me. For as much as__________________and_____________________have consented together in holy matrimony and have witnessed the same before us declaring their commitment, I pronounce that they are husband and wife. I ask you now, in the presence of God and these people, to declare your intention to enter into union with each other through the grace of Jesus Christ, who calls you into union with himself…..
Pastor to woman, then to man: __________________________, will you have ___________________________ to be your husband, to live together in holy marriage? Will you love him, comfort him, honor and keep him, in sickness and in health, and forsaking all others, be faithful to him as long as you both shall live? Do you who represent their families rejoice in their union and pray God’s blessing upon them? Will all of you, by God’s grace, do everything in your power to uphold and care for these two persons in their marriage? Scripture Reading ­ John 15; Corinthians 13 or scripture of your choice. Homily ­ 3 minute message regarding Christian love and marriage. The man or the woman, then the other, repeat after the pastor: I take you, ________________________ , to be my wife/husband, and I promise before God and all who are present here to be your loving and faithful husband/wife as long as we both shall live. I will serve you with tenderness and respect, and encourage you to develop God’s gifts in you. In the name of God, I take you to be my husband/wife from this time onward, to join with you and share all that is to come, to give and to receive, to speak and to listen, to inspire and to respond, and in all our life together to be loyal to you with my whole being as long as we both shall live. These rings are the outward and visible sign of an inward and spiritual…. The man or the woman with ring in place, repeats after the pastor: __________________________, I give you this ring as a sign of my vow, and with all that I am and all that I have, I honor you; in the name of the Father, and of the Son, and of the Holy Spirit. We are joyfully gathered today to witness and to celebrate the joining of two lives in marriage. __________________________ and _________________________ have invited you to be with them and to rejoice with them as they make this most important commitment. The essence of this sacred covenant is the accepting and honoring of each other as life partner, everlasting lover, heart companion, and soul friend. It is, therefore, a decision that is entered into with great consideration and respect. It is with reverence and joy that we create this ceremony together. We have come together with the hope that the love which has brought you together will deepen and that it will go out beyond itself into the lives of others. Thus, we ask that the hopes and promises of this union be realized. May you both be granted the patience to listen, the capacity to understand, the compassion to give comfort and the joy to laugh and just to be your Selves. Let your marriage make a home where neither of you is ever lonely. Let your marriage offer illumination and the nourishment of shared experiences. May your union be strong enough to endure the difficult times. May life’s challenges not separate you; may you always be able to turn to each other. __________________________, do you take ___________________________ to be your husband? Bride answers “I do”. Do you promise to love him, honor him, comfort and keep him in sickness and in health, and be faithful to him as long as you both shall live? “I do”. Officiate addresses the groom as above. I, _______________________ take you __________________________ to be my wife. I promise to be your loving and faithful husband. I will love, honor, and respect you on a daily basis. I will keep my heart open to you thru all of our life’s challenges. From this moment on, I am blessed by you being my life’s partner and I promise to cherish you and be kind. Officiate addresses the groom as above. 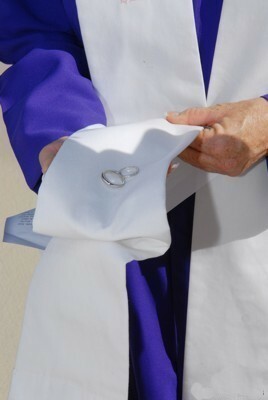 The wedding ring is an outward and visible sign of an inward and spiritual union. The ring is a symbol of the commitment you are making to each other. May I have the wedding rings, please. Your rings are sacred circles. A circle is the symbol of wholeness, peace, and unity. As circles, your rings have no beginning and no ending. 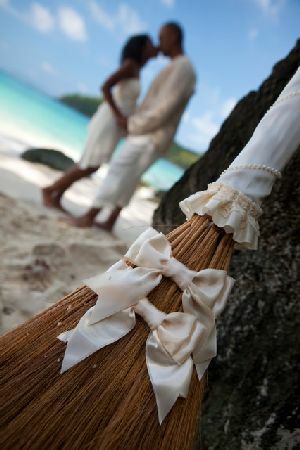 They are the symbols of this growing relationship you have come here to celebrate and confirm. You wear them with the blessing that you have a partner in life and that you are each other’s life partner. As a sign of your love for and faithfulness to each other, place the ring his/her finger and repeat after me, With this ring, I thee wed, and with all that I am, I honor you. May your love be a moving sea between the shores of your souls. May the radiance of the promise you bring to each other never diminish even as the ocean around us. Go now in joy and live in present moment with gratitude as you create your future together. Having heard the vows you have just made with each other, made by the sun, sand and sea of St John, witnessed by these loved ones, by the power invested in me the by the United States Virgin Islands, I now pronounce you husband and wife, you may now kiss the bride. “Bless you for the wonderful service! “Your calm, serene presence enhanced the beauty of our marriage ceremony. So did you find your marriage ceremony option? Then now you can call Anne Marie.